The Cardinals re-signed veteran wide receiver Kendall Wright, according to a team announcement. The Cardinals had two vacant roster spots prior to signing Wright, so no one had to be dropped in order to accommodate the deal. 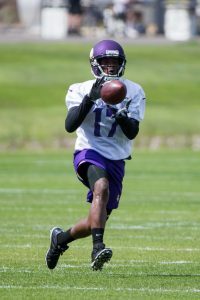 Wright, a 5’10” veteran receiver, originally signed with the Cardinals on Oct. 8 and was inactive for one game prior to his release ten days later. Wright offers 82 games of NFL experience, but he has probably lost a step or two since his early days with the Titans. Wright was originally signed in order to bolster the receiving corps while Larry Fitzgerald was dealing with a hamstring injury. After Fitzgerald caught eight passes for 102 yards and a touchdown on Sunday against the 49ers, Arizona is confident about the 35-year-old’s health. This time around, Wright is on the roster to provide overall depth at the position. With Wright in the fold, the Cardinals have six receivers on the roster as he rejoins Fitzgerald, Christian Kirk, Chad Williams, J.J. Nelson, and Trent Sherfield.